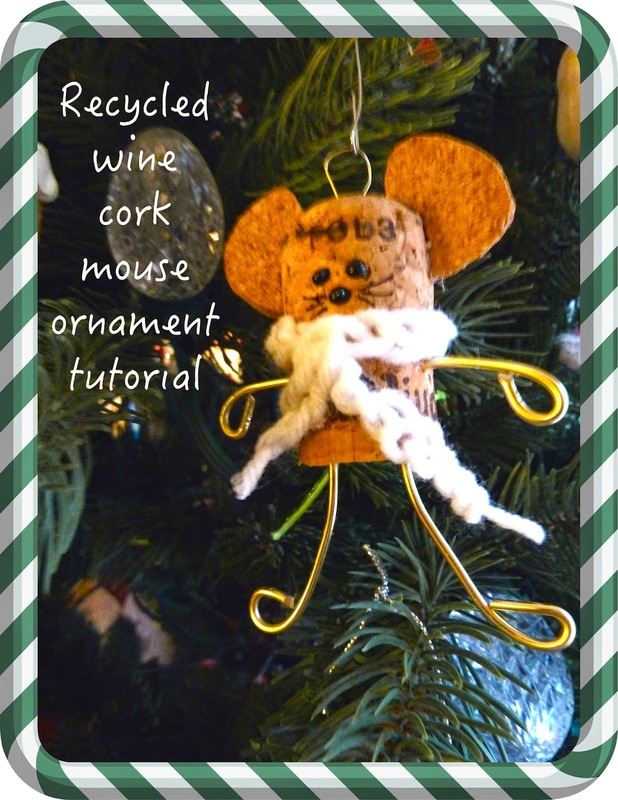 This little mouse is quick and easy to create using only an 1/8” thick scrap of cork, a recycled champagne cork, and a little bit of yarn and wire. He looks great on the tree or attached to a package or gift wine bottle. 1. Download the mouse ear pattern and trace two ears onto 1/8” thick cork sheet scrap. Cut out using an X-acto or craft knife. Fit to the sides of the head to make sure it is fitting perfectly. Trim to fit if necessary. 2. Use a small awl or nail, make two holes in the bottom of the champagne cork. Cut two three -inch pieces of 16 gauge wire with wire cutters. (Legs) Dab a bit of tacky glue on the ends and insert into the holes you made in the bottom of the cork. 6. Make a hole with the awl or nail in the top of the head. Cut a two-inch piece of 16-gauge wire, fold in half, add a dab of glue on the two ends and insert into the hole in the top of the head. Adjust into a loop for hanging. 7. Make the scarf by making a chain with worsted weight yarn. My scarf was 21 chains long. You can do this with a crochet hook or just use your fingers. Glue this around his neck and cross it over in the front. Let dry. Note: If you use a thick yarn you won’t need to chain. 8. If you would like your mouse to have an optional tail cut a 4-inch piece of Rat tail satin cord. Use the awl to make a hole in the back of the mouse, add glue to the cord and push in with the awl or nail. Let the glue dry. 9. To make his face add two dots of black dimensional fabric paint for the eyes and one for the nose. Use a sharpie marker to draw on the whiskers. I'm totally in love with this! So sweet. Pinned and tweeted. We appreciate you being a part of our party, and I hope to see you on tonight at 7 pm. We love partying with you!